“Lo Siento,” the lead single of Super Junior‘s Replay—a repackage of Super Junior’s eight studio album Play—was an unprecedented success. The song was produced by rapper-producer duo Play-N-Skills, featured the vocals of Bachata singer Leslie Grace, and marked the first collaboration between Korean and Latino artists. The trilingual, Spanish-guitar-tinged single debuted at No. 13 on the Billboard Latin Song Sales chart—becoming the first K-Pop song to ever do so—and No. 2 on the World Digital Songs Sales Chart. It even beat out Selena Gomez and Luis Fonsi to win Best Collaboration at the Nickelodeon Kids’ Choice Awards Mexico this year. Given that, Super Junior’s return with their first and special mini-album—the Latin-Pop-tinged One More Time and its eponymous lead single—surprises nobody. However, unlike most follow-ups or recreations of previous successes that are insulting, made-for-money copies of its original—à la nearly every Hollywood sequel ever made—One More Time retains the magic of what made its predecessor so popular. One More Time is a 5-track-long mini-album, comprising of songs fused entirely with Latin sounds. The album tells an inverse push-and-pull love-story of sorts. One More Time ends with Super Junior wanting to take it slow with their lover (“Lo Siento (Play-N-Skills Remix)”) and starts with Super Junior asking their lover to stay with them on their last night together (“One More Time (Otra Vez)”), with songs detailing Super Junior’s intense feelings—desire (“Animals”) and resentment (“Adora Tu Puedes Marchar”)—towards their lover in the middle. The album’s eponymous single, “One More Time (Otra Vez),” is a mid-tempo track infused with Spanish guitar, Afro beats, and the featuring vocals of Reik, popular Mexican pop-rock band celebrating their 15th anniversary this year. 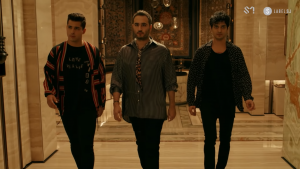 It is a plea from Super Junior and Reik to their lover to begin anew with their relationship one more time as they dance during their last night together. The woeful lyrics contrast against the catchy, mid-tempo beat of the song, which the listener can’t help but sway to. The track is noticeably missing a rap, and showcases Super Junior’s vocal prowess, especially vocalist Ryeowook‘s and rightfully so—this mini-album marks Ryeowook’s first comeback since his return from enlistment. Super Junior’s voices mesh together beautifully with Reik and their harmony leaves the listener wistful and wishing that Reik had more than just the chorus. “One More Time (Otra Vez)” is followed by its “SJ Version”, which doesn’t feature any major differences from the original other than Super Junior singing the chorus. The similarity between the songs arouses confusion as to why Super Junior slotted it right after the original; listeners don’t always want to listen to the same song twice when listening to an album. Super Junior would have been better off had they made the “SJ Version” the last track of the mini-album, similar to Replay‘s tracklist. “One More Time (Otra Vez) SJ Version” gives way to “Animals.” Animals also begins with Spanish guitar, which melds with a Dancehall-Reggaeton beat to create a soothing mid-tempo song. Ironically, this soothing song is about Super Junior surrendering to their burning desire for their lover despite fearing it. The third song on the mini-album is “Ahora Tu Puedes Marchar,” which roughly translates to “Now You Can Leave.” This song was originally an ’80s synthpop song sung by Mexican singer Luis Miguel. Super Junior rework it into an upbeat, brass-instrument-based instrumental. This instrumental contrasts with the lyrics about Super Junior instructing their lover to leave because she hasn’t reciprocated their love and devotion. Though the song’s lyrics make sense with the overall theme of the album, its fast, cheery vibe is jarring in a collection of mid-tempo songs. Super Junior would have been better off excluding this song from their mini-album, or slowing it down so it wouldn’t sound so out of place. One More Time comes to a close with the Play-N-Skills remix of “Lo Siento.” Play-N-Skills enhances “Lo Siento” with a dance-hall beat that builds up to an instrumental chorus punctuated by Leslie Grace’s vocals and by African drums. This remix brings a satisfying conclusion to a cohesive and well-produced mini-album. The tracklist could admittedly use some rearranging, however, One More Time illustrates Super Junior’s growth as an artist as they veer out of their comfort zone, explore different genres, and collaborate with seasoned musicians to produce, and makes me wish that Super Junior collaborates with more artists across the globe, several more times.